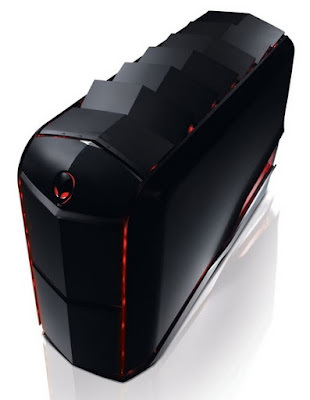 The Alienware Aurora ALX looks almost identical to the previous Aurora gaming rig we tested, with the addition of motorized vents on top of the tower. The entire cabinet uses black plastic, except for the LED-lit translucent acrylic strips the sides. Calling this machine feature-rich would be an understatement. Built around an Intel X58 chispet, it is powered by an Intel Core i7 Extreme 980X processor, which has six cores, is clocked at 3.33 GHz, and has 12 MB L3 cache. It is equipped with a whopping 24 GB RAM and has two 320 GB hard drives; rather meager for such a powerful machine. 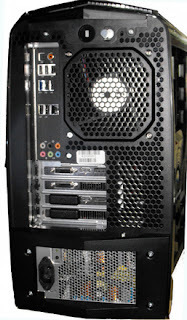 There are two ATI Radeon HD 5870 graphics cards in CrossFire, and each has two DVI ports, an HDMI and a display port. These cards seamlessly handle the most demanding games at maxed out settings. 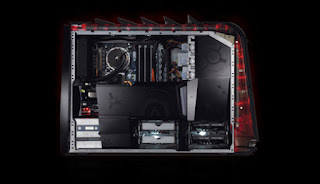 With fire power like that, the Aurora ALX is by far the most powerful machine we’ve tested. The front panel sports memory card readers and a Blu-ray combo drive. At the back, there are seven USB ports (one is USB 3), an Ethernet jack, six audio jacks and optical out. The rig comes preloaded with Windows 7 Ultimate. Crysis Warhead delivered 40 fps in Enthusiast modewith 8X AA and everything else maxed out, which is really something. After we fi nished testing, we went into the BIOS settings and increased the multiplier for all six cores to get higher clock speeds. With a multiplier of 32 (default 25), the PC froze, but at 31 we got the highest clock speed of about 4.14 GHz (default 33.3 GHz). After overclocking, video encoding and fi le compression were faster by three or four seconds, and game framerates improved marginally. Here’s the question though - do you really want to spend Rs 3 lakh on a PC? You can assemble a high-end gaming rig, which can play Crysis and other demanding games at maxed out settings, for less than half this price.It's extremely Expensive!